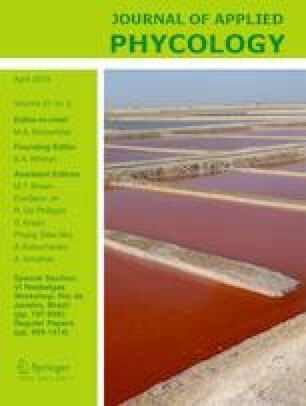 Development of transgenic strains of microalgae is necessary to obtain microalgal strains that are capable of producing high levels of oils and a variety of bio-products. However, microalgae have a much lower transformation efficiency in comparison to other micro-organisms due to the presence of thick cell walls. Here, a two-pronged approach for optimizing the electroporation parameters combined with the application of secondary metabolites from myxobacteria to weaken the cell wall was used to maximize the transformation efficiency of Nannochloropsis salina (Eustigmatophyceae). When the electroporation parameters were set at 50 pulses of square waves at a field strength of 12,000 V cm−1, a transformation efficiency of up to 53 per 108 cells was achieved for N. salina in the early exponential phase of growth. Next, cultivation of the microalgae using bacterial conditioned F2N medium containing 10% supernatant of the myxobacteria strain DZ2 resulted in a moderate inhibition of the growth rate and distinctive morphological changes. Flow cytometry confirmed an increase in the overall cell size as well as granularity. When the bacterial medium conditioned cells were employed for transformation under optimized electroporation conditions, the transformation efficiency improved 2.71-fold up to 144 per 108 cells. Taken together, a combinatory approach for electroporation using high field strength square wave pulses and conditioning cells with myxobacterial supernatant is a promising method for the efficient genetic transformation of microalgae. The online version of this article ( https://doi.org/10.1007/s10811-018-1599-7) contains supplementary material, which is available to authorized users. This work was supported by a grant from the Advanced Biomass R&D Center (ABC) of the Global Frontier Project, funded by the Ministry of Science and ICT (ABC-2010-0029728 and 2011-0031350).